A highly popular option for people used to warmer weather conditions, Rogue's Breezy hats are manufactured with cotton mesh crowns for maximum ventilation in the field. Brims and trims are available in Buffalo leather, full grain Cowhide leather and Suede leather options, making the Breezy design one of the most popular hats in the Rogue range. The cotton mesh allows full head cooling and is far more effective than standard eyelets for providing a cooling breeze on a hot day. 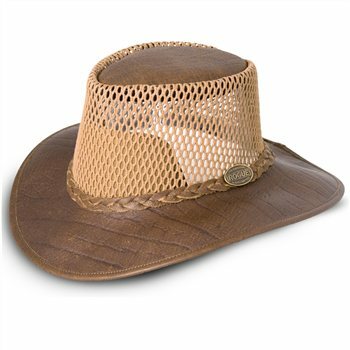 The breezy hats also include an integral forehead protector as standard. Totally amazing hat. love the stiffness that the leather gives the brim. Great for field work, golf, and other activities in the sun.